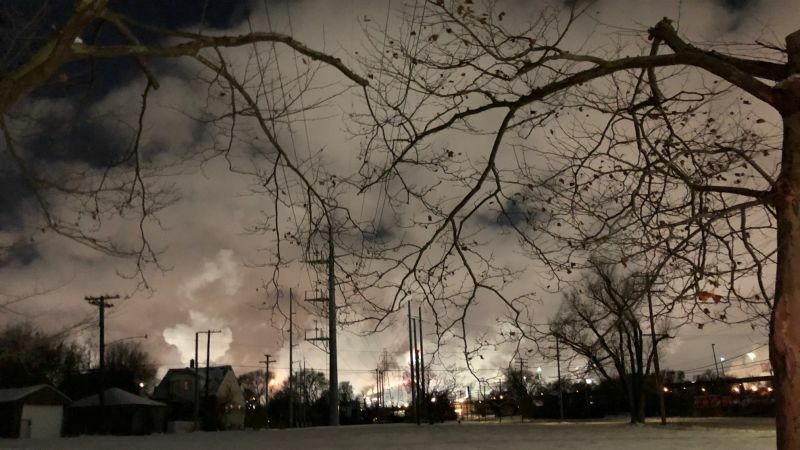 Fed-up residents in Michigan’s most polluted zip code say the tar sands refinery next door is causing toxic emissions to waft over their neighborhood—and they want out. Marathon Oil Corporation, which operates the 250-acre Detroit oil refinery, bought the homes of residents in the nearby, mostly white neighborhood of Oakwood Heights in 2012 so that they could move. Boynton, a mostly black neighborhood which is also impacted by the refinery, was not given the same offer. Activists from the neighborhood continue to make noise about the unfair treatment. The community protested at the refinery in November, carrying signs with slogans including: “Exodus” and “Marathon Petroleum: Expand the buffer zone, Buy more homes”. There will be more protests to come in 2018, said Boynton resident and activist Emma Lockridge. She works for Michigan United as their climate and environmental justice organizer. “We have to do what we think will get their attention and turn that no into a yes,” Lockridge told Earther. The community is still working out the details of its strategy, but Lockridge said she will keep protesting until they get a buy-out like Oakwood Heights. They’ll also move forward with a federal class-action lawsuit, filed by one thousand Boynton residents in 2016, that alleges the refinery releases harmful pollution. Marathon, Lockridge said, has made life unliveable in Boynton. The refinery processes 132,000 barrels of oil per day, including Canadian tar sands oil—known to be among the dirtiest types of oil. “Emergency sirens went off in the morning, blasting me awake,” Lockridge said, recalling the previous Saturday morning in Boynton. Soon after, she received a text from Marathon—the refinery has a text system for nearby residents—saying everything was fine. When Lockridge went outside that morning, she saw emissions from Marathon blanketing the neighborhood. “We looked like a science fiction film,” Lockridge said. The pollution has been getting worse ever since the refinery built an expansion in 2012 to process tar sands oil. The sights of smokestacks, flares, and heavy industry dominate the neighborhood. Oil tanker trucks rumble through, delivering fuel to a tanker farm down the street. Strong odors sometimes awaken residents in the middle of the night. For a while, Lockridge even wore a mask at night to protect herself. Residents are worried about what chemicals they are being exposed to by the refinery, and the potential impact on their health.